A couple of weeks ago, Pure sent me their BB cream in the new shade ultra light. Their BB cream is one of my favourite products of all time and I have spotlighted it in previous posts many times! It's definitely been in my monthly favourites almost every month in the past 4 months and I continue to love it and I can't find a better BB cream (I have tried others, including more expensive ones such as Dr. Jart). I purchase mine from Savers and at only £1.99 I really have to say it's a fantastic bargain for such a great product. The reason why I didn't review it straight away is because I wanted to try it over several weeks depending on my foundation I wore above it, powders, my skin care routine, the weather, etc., etc., as you never really know! My usual tube on the left in "light" and the new product I got sent to try in "ultra light" on the right. The shade they sent me was in "ultra light" which is a new shade I believe is not for sale yet (at least it isn't on the shelves where I usually buy mine). After using the new BB cream for a few weeks, I have to be completely honest: I realized I just didn't actually have much of a review to write about. The BB cream itself is the same, it works just as well as the light shade I've been repurchasing over and over... I would repurchase my usual light shade as opposed to the ultra light if they were to stock it in my Savers only because it gives me more coverage which is what I prefer. I find I get more coverage from the light shade however the ultra light shade gave me a more dewy/glowy look. 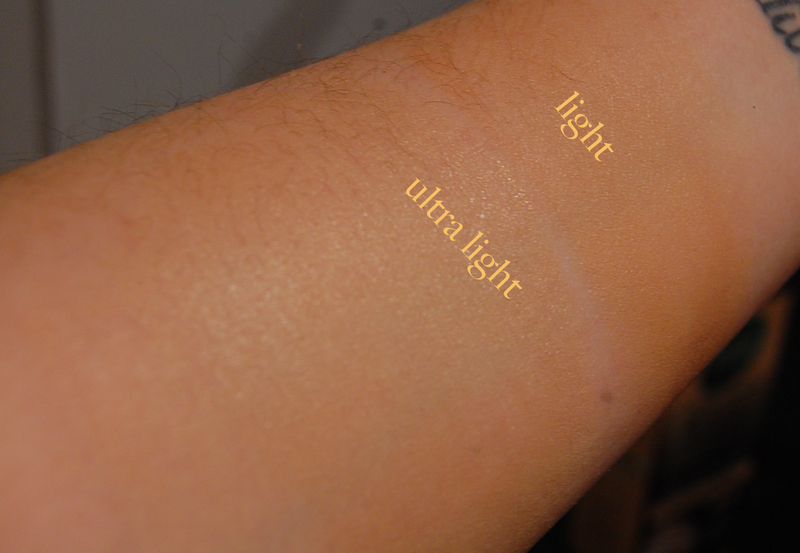 Nearly blended in swatches of both ultra light and light shades. If you're looking for a BB cream to use under your foundation routine, the ultra light would work perfect for you as it is not as dark as a foundation and also works as a primer. In comparison, the light shade in this BB cream gives more coverage and personally I can rely on that as my foundation for days when I don't want to wear a full face on make up, however I would use both BB creams in the two different shades depending on my make up routine and skin. I definitely can see the differences between the two different shades and the ultra light shade would work fantastic for those looking for a lighter BB cream or people with a very pale complexion. Please read my full review and comparison of the Pure BB cream here to find out what I think of it HERE. & I also mentioned it here & here! I still rate this product highly and continue to repurchase it other any other BB creams on the market. The fact that they sent me one of them to try does not change my opinion on them at all. I would recommend this to anyone and definitely do tell everyone I can. It looks like a really good BB cream :) I would like to try it out!